Destin Seafood Festival – It wouldn’t be the Destin Fishing Rodeo without the Destin Seafood Festival! Held on October 7 from 11 AM – 4 PM, the festival is an integral part of Destin’s history. Enjoy fresh local seafood, live music, and art from local artists! The event is held on Destin Harbor and brings visitors from all over the country. 11th Annual Baytowne Beer Fest – For those who are 21 and up, head down to the Village at Baytowne Wharf for the 11th Annual Baytowne Beer Fest! Known as the “Best Beer Fest on the Emerald Coast,” you’ll get the chance to sample offerings from over 40 on-site brewers with nearly 200 domestic and international flavors. You’ll also get to enjoy live music and food from Baytowne merchants! Before you can book the fun, you’ll need a place to stay! Fall break is the perfect time to travel with family, so we’ve picked out a few of our favorite Destin homes for a fall vacation. Already There – This seven bedroom, seven bathroom home features a carriage house and can easily accommodate 25 guests. Live the life of luxury with three floors of fun, with a rooftop deck that looks out over Destin’s beautiful beaches. Plus, the home features its own boardwalk that will take you directly to the Gulf! What’s not to love? Already There only has a small window of availability, so reserve your spot in this popular home while you still can! Come Together – Located just down the street in the coveted Grand Palms community, Come Together easily sleeps up to 30 guests! Hop on the supplied golf cart and cruise the area or head to the nearby beach access. The home features a private pool at the front of the home as well as a carriage house, complete with a media room and plenty of comfortable space for everyone. 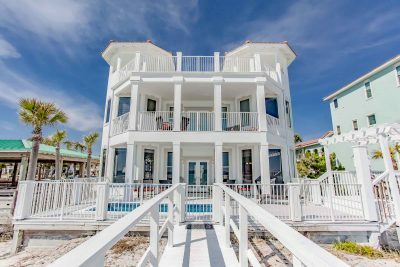 Casa Oceana – Reserve a stay at this beautiful “Ocean House” in Destin’s popular Destiny by the Sea neighborhood. Seven bedrooms and seven and a half bathrooms accommodate 26 with ease! Enjoy luxurious accommodations during your stay, including a game room, theater room, and private balconies. Splash around in the private pool or head to the nearby beach. Whatever you choose, you’re sure to enjoy your stay here! What some of your favorite fall activities in Destin? Check out our events calendar for more things to do in the area. We hope to see you at the beach!